BAYERN Munich's boss, Louis van Gaal, expects Arjen Robben back in action next month, as the club tries to finalise Luiz Gustavo's capture. 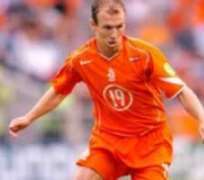 The Dutch international has not played for the Bundesliga giant since returning from the World Cup in South Africa with a torn hamstring. Van Gaal has confirmed that the Chelsea and Real Madrid former ace was back in full training and pain free, though he would need to be patient for a little longer. Meanwhile, Bayern's supremo, Karl-Heinz Rummenigge, insists that no decision has been made over the possible signing of Hoffenheim's Brazilian midfielder, Gustavo. Hoffenheim's co-owner, Dietmar Hopp, said he thought it was 'pretty clear' Gustavo would join Bayern next summer, and that Rummenigge's feelings are premature. Rummenigge has also cast further doubt on the future of Bayern's captain, Mark van Bommel, who is out of contract at end of the season, by stating the club does not automatically renew deals. 'I've spoken to Mark again recently and I've heard him say that he wants to stay at least until the end of the season,' he concluded.